Moles are nearly blind burrowing mammals from 6 to 8 inches long that have hairless snouts and powerful front feet with webbed-claws. They dig elaborate tunnel systems under gardens and lawns where they eat grubs and worms. They emerge on top of the ground to leave unsightly, volcano-shaped mounds of freshly dug earth. Six species of moles live in North America. The most efficient ways to get rid of moles is to trap them or poison them. Packing a lawn with a heavy roller may kill moles in the early morning or late evening. If your lawn is small, you can exclude moles by burying a 24-inch roll of hardware cloth or sheet metal around the perimeter. Bury it 12 inches deep and bend the top out at a 90-degree angle. Planting marigolds on the borders of your lawn may repel moles, but this method has not been tested systematically. Whether you plant poison for moles or trap them, you first have to locate their main tunnels. The den of a mole, about the size of a quart jar, is connected to hunting grounds by deep runways 5 to 8 inches beneath the top of the ground. The runways follow the movement of worms and white grubs; the runways are shallow in wet weather and deeper in dry weather. 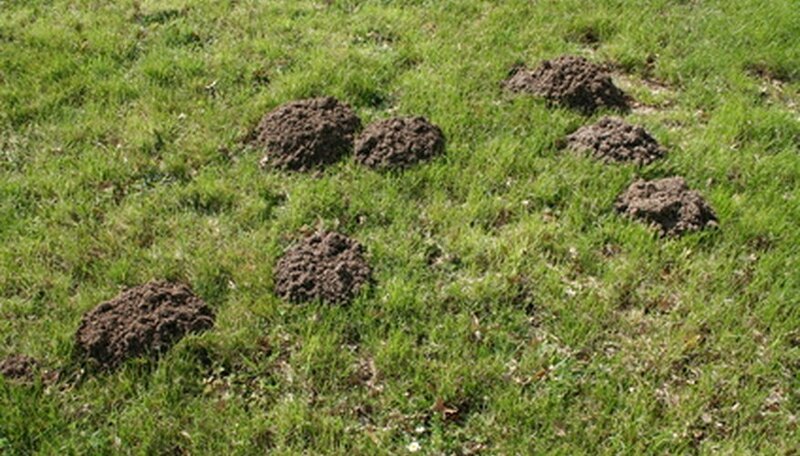 Traps are most effectively set in permanent or deep tunnels that moles may use several times daily. Step down on a tunnel; if moles reopen it within 24 to 48 hours, it is being actively used. Main tunnels are generally straight or connect two surface mounds or branching tunnels; they will often follow fences, walks or building foundations. Researchers at Michigan State University report success of poisoning moles with pellets containing chlorophacinone. The U.S. Environmental Protection Agency registers aluminum phosphide in gas cartridges and in the form of pellets for use against moles. These fumigants are best used in deep tunnels, not those near the surface. The three main types mole traps are the harpoon, the scissor-jawed and the choker loop. They are activated when a mole passes over a trigger pan set in a hole dug in a main tunnel, according to the Internet Center for Wildlife Control. When a mole passes over the trigger pan of a harpoon trap, a spring-loaded harpoon shoots down into its back. A spring-loaded scissor-jawed trap snaps shut when a mole ventures onto the trigger pad. A choker trap has a loop that yanks tightly around the neck of a mole that ventures onto the trigger pad. The Internet Center says that no studies have been conducted to prove the effectiveness of electromagnetic devices marketed to repel moles. There is no evidence that planting caper spurge (Euphorbia latharis) will repel moles. The legality of poisoning or trapping moles varies with state and local laws. Castor beans that are sometimes used to poison moles are poisonous to humans.